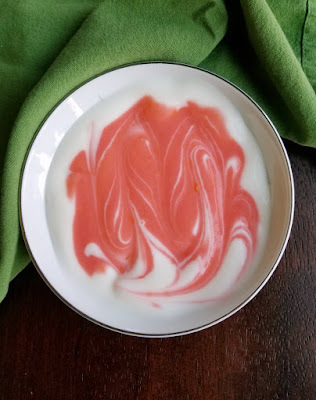 This fun and citrusy blood orange curd is the perfect sweet spread for so many things. It is super simple to make too! 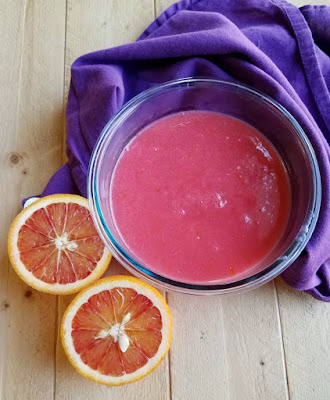 If you like lemon curd, you are going to love this blood orange curd! It has that citrusy tang and sweet and sumptuous texture. Plus it comes together in just a few minutes with very little effort. 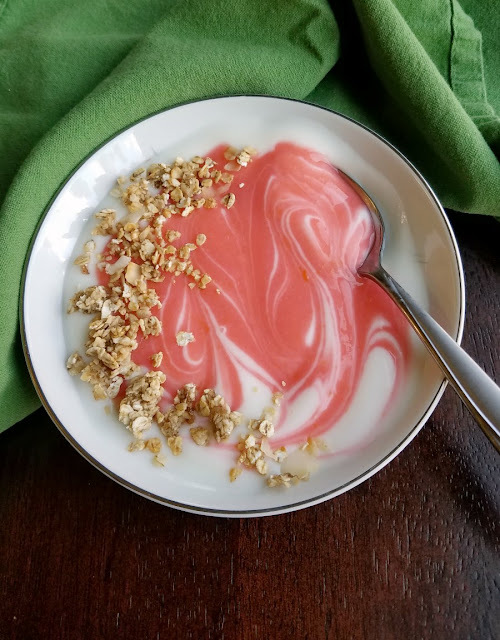 You can spread it on toast or muffins, swirl it into yogurt or fill your cakes with homemade goodness! I am sure by now you know if I make a curd recipe, there is sure to be a cake coming. And you are right if that is your guess. A while back I got a box of super fun fruit from Melissa's Produce. It was all "freaky fruit" getting ready for Halloween. 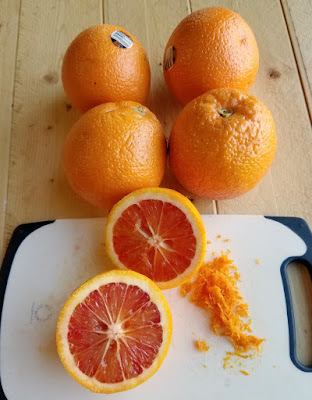 Blood oranges were a natural part of the mix. 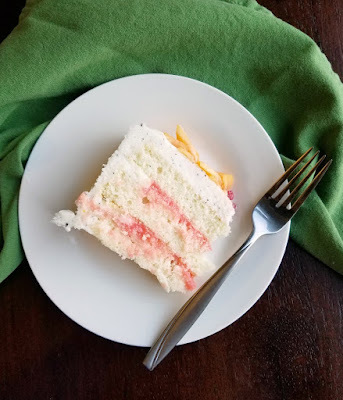 I am going to share a super fun cake with you later in the week and this blood orange curd was a perfect filling for it. Thought it would also be great as a filling in a plain white cake as well with some vanilla buttercream. The orange and vanilla mix would be a lot like our beloved creamsicle and the color is so pretty too! The slightly pink/orange tone is so pretty and sherbet like. Since it does not take a lot of orange curd to fill a cake, we swirled the rest into plain yogurt and topped it with some banana granola I will be sharing with you later on this month. It would be fabulous with toasted coconut granola as well! I started making my lemon curd in the microwave a couple of years ago when I was working on cheesecake toppings for my sister's wedding. Now it is the only way I make curds. It is so simple and the results speak for themselves! Don't get impatient and set the microwave for larger time intervals. You don't want to end up with scrambled eggs! If you do get a couple of lumps, don't despair! You can always strain them out. Though a thermometer isn't completely necessary, it is handy to make sure you are in the right temperature range. Too much or not enough heat can both have detrimental effects on your curd. I made a superfine zest and left it in. You could strain it out or just not use it at all if you prefer a completely smooth curd. In a very large glass bowl (the mixture will boil and you don't want it to bubble over), whisk together orange juice, sugar and eggs. Add the stick of butter. Microwave in 30 second intervals, whisking vigorously after each trip to the microwave. You will feel the mixture start to thicken as you go. Once you think it's close, start taking the temperature with an instant read thermometer. Stop when the mixture reaches 185 F. Cook time will vary based on your microwave, but should be roughly 5 minutes. For a more citrusy flavor, stir in the finely grated zest of one blood orange. The egg yolks have the potential to change the color a bit towards the orange side. 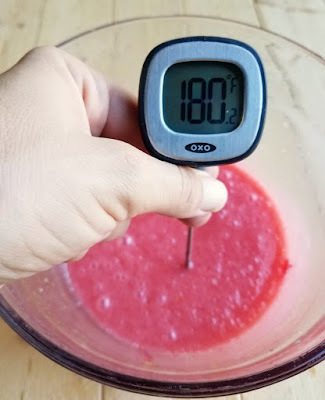 If you want a stronger pink/red color, feel free to stir in a drop or two of red food coloring. If you got any clumps while cooking the curd, strain the mixture. Then cover and refrigerate until firm. Store in the refrigerator for up to a couple of weeks or freeze a portion if desired. Isn't it pretty? Thanks beautiful! THAT COLOR! 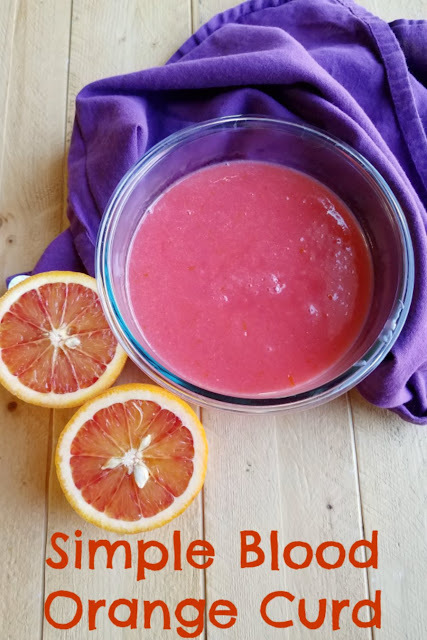 I'm sure blood orange curd tastes amazing but I'd make it for the color alone :). I can't wait to see the cake you post with it; I'm drooling already! You could definitely make a beautiful cake with some, so do it!!!! Well, you know that I like lemon curd, and I am anxiously awaiting your cake! Have a great week. It's going to be a fun one for sure! Hi Carlee, I do like making curd, but have never made it in the microwave before. It sounds less work than the stove top variety, I'm not sure that I'm brave enough to try it though! The microwave makes it so easy. Just be sure to stir in frequently to keep is smooth! I know I would love this. Isn’t the color amazing? It is so pretty and perfect for so many things too! Well, I didn't know about making curd in the microwave! It makes is so easy!